I attended an Anita Goodesign Embroidery Party last Fall. Had never been to one before, but it was a two-day event that was so much fun. As a result of this event, I did sign up to belong to their club, so now I get treated to new designs every month for a year. Life has gotten in the way for the last several months, leaving me neither the time nor desire to sew. 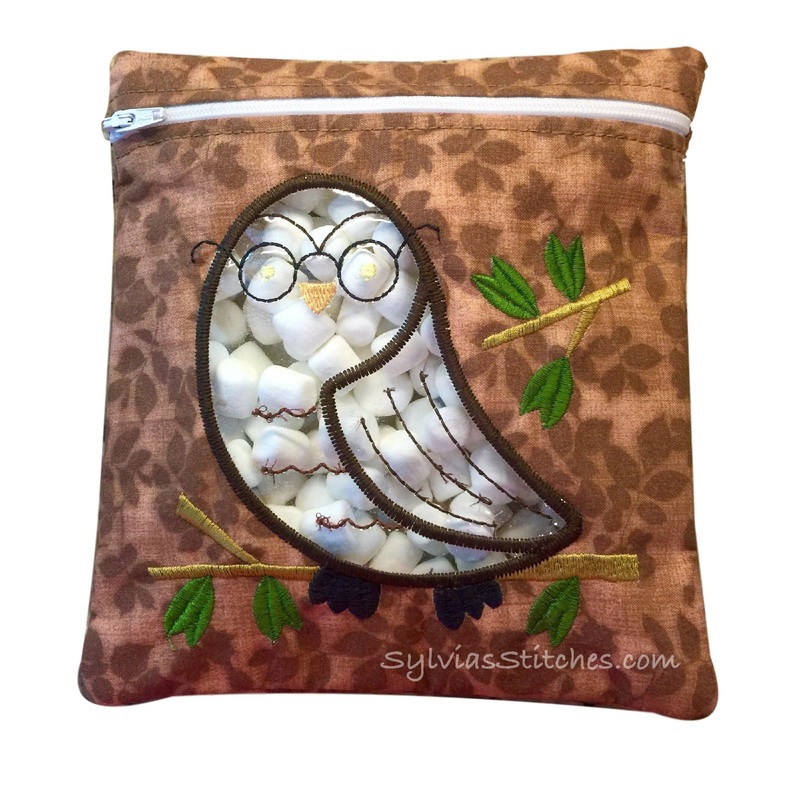 Having settled a bit now, I recently began spending more time in the sewing room. Last week was those little fuzzy bunnies from Artistic Thread Works. I would like to try something new each month that comes out of the monthly designs in the Anita Goodesign clubs. So, I decided to try the in-the-hoop snack bags. These reusable quart-size zippers bags feature a vinyl window. I chose five out of the fifteen designs to make. They were quite cute, and stitching on the vinyl was no problem. If you haven't tried in the hoop projects before, they are easy and fun to do. 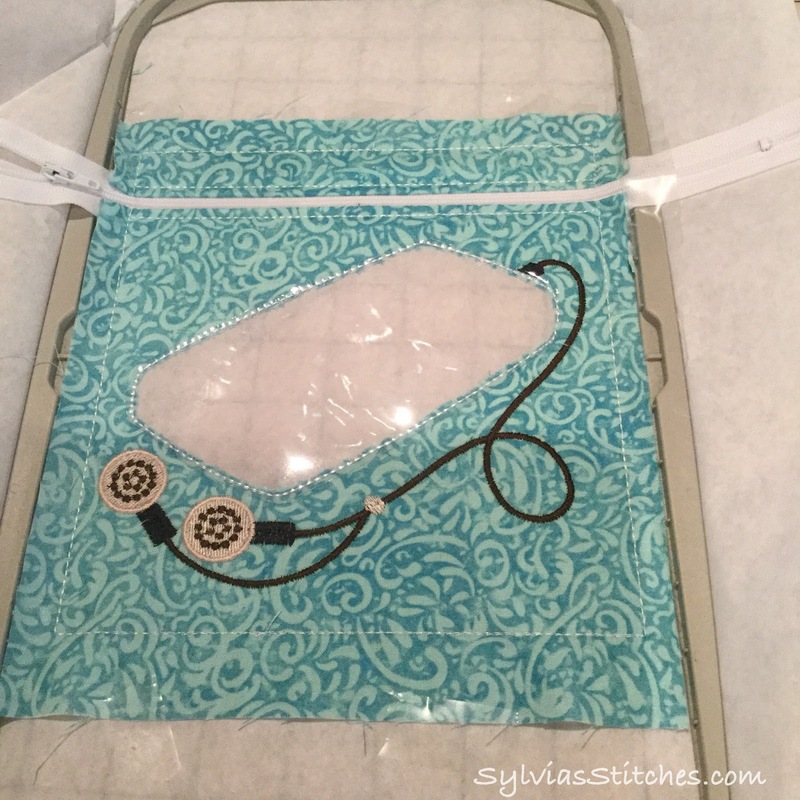 Love the zipper bags as it means the entire project is stitched while in the hoop, with no openings to manually stitch closed at the end. First the front fabric is stitched along with the zipper. Embroidery of the design is done as well. A placement stitch for the vinyl is stitched. 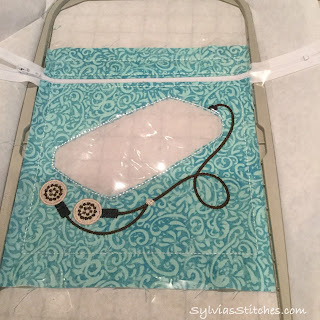 Place the vinyl, run the tack down stitch, and then trim as with an appliqué. 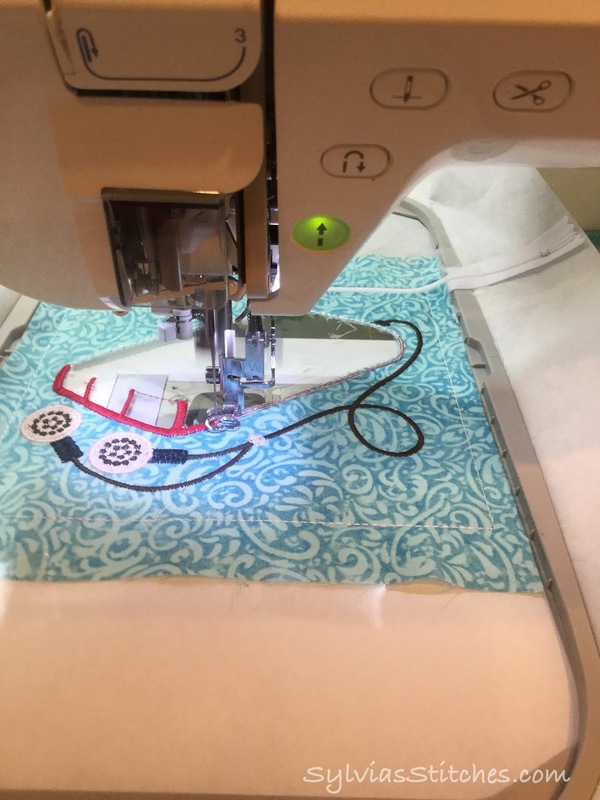 Run the rest of the embroidery design. Trim the stitches and turn out when done. Three things I learned from with this project. I prefer to have a liner inside my reusable bag. The first one I did was the iPod design, so I did it as instructed without a liner. 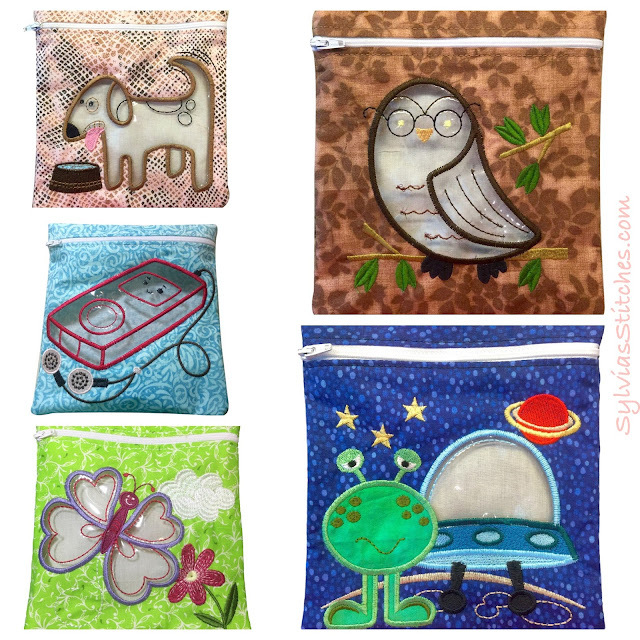 For the following bags, I added a fabric liner. I could not add on to the front easily with the vinyl appliqué, so I added a muslin fabric piece to the back side. 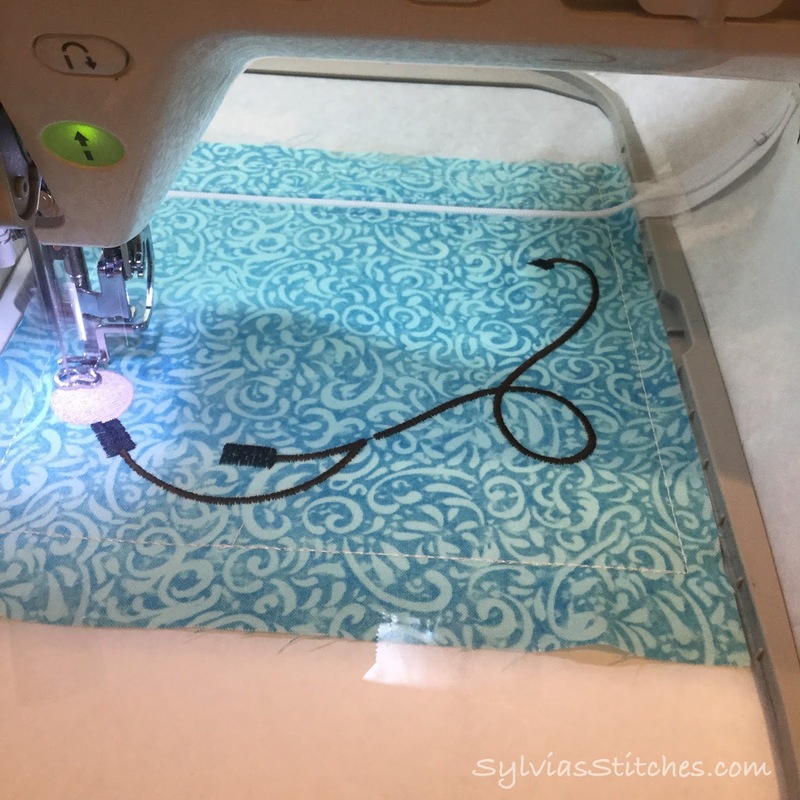 When stitching on vinyl, it looks better to match the bobbin thread color with the top thread. 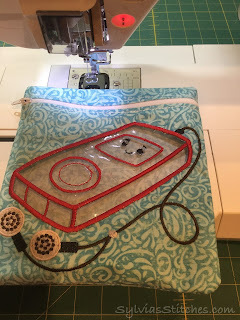 I usually have the white bobbin thread on the bottom, but when stitching thin lines on the vinyl, the bobbin thread may be seen through the clear vinyl. 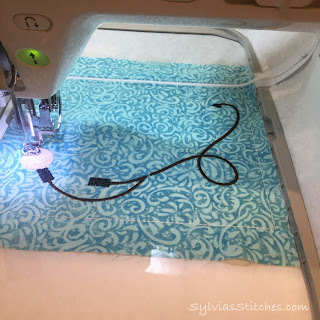 When starting my embroidery on the vinyl, it is better to hold the upper thread tail at the beginning to leave a smaller thread knot on the back side. Less visible through the clear vinyl window. So cute, Sylvia. I'm a fan of the iPod bag, too. These are cute! I really like that iPod bag!!! Thanks for sharing at Submarine Sunday! !